By David Ponce on 04/13/17 • Leave a comment! 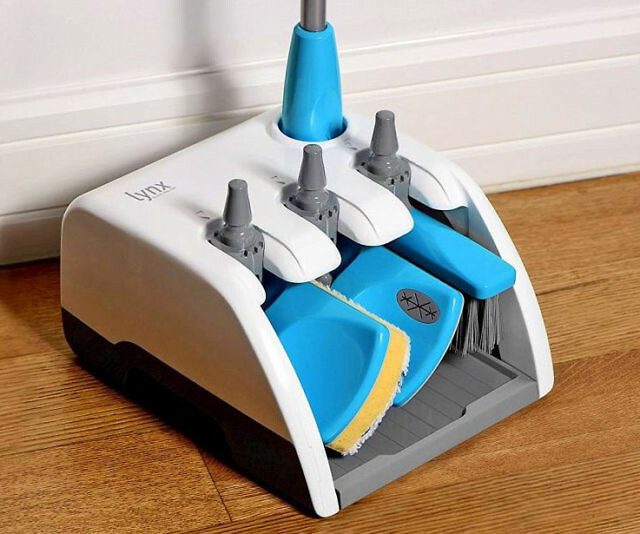 Getting your floor cleaning game on will cost you $40. You’re elbow deep into your home renovations and now’s the time to start cutting some holes into the drywall so you can fit a bunch of electric outlets. Well, have fun. You’re going to have to get the reciprocating saw out and do your best to cut in a straight line. 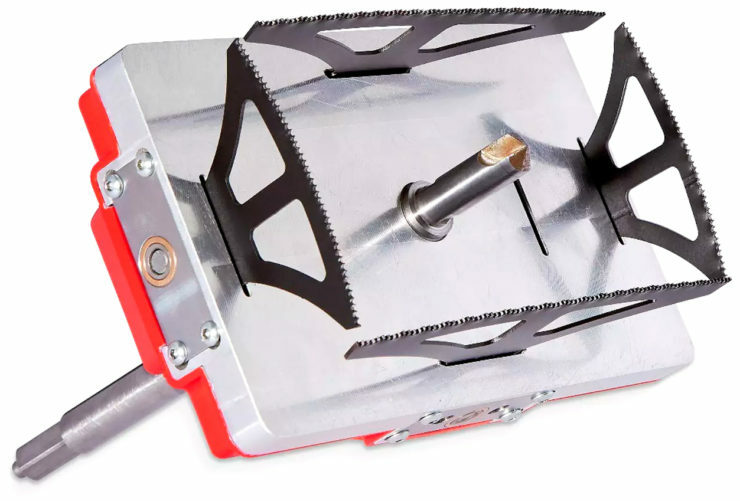 Or, you could just get the Quadsaw adapter, which would allow you to cut a rectangular hole in one go, in as little as 30 seconds. It connects to a drill, which powers the four reciprocating blades simultaneously. We don’t know the exact size of the hole it makes, but we’re really hoping there’s a standard for electric outlet hardware which this device matches. 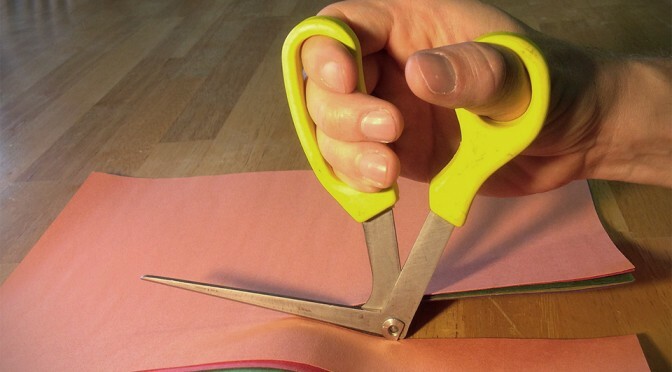 The blades, incidentally, can also be repositioned to cut a perfect square, but once again we don’t know which size and their website doesn’t seem to specify it. It’s also really not cheap, at £199 (~$250 USD), but if you’re an electrician, construction worker, or just a really prolific DIYer, it might be a worthwhile investment. If you find yourself trying to fix your fixable electronics on a regular occasion, you’ve probably realized that the process goes a lot more smoothly if you have the right tools for the job. 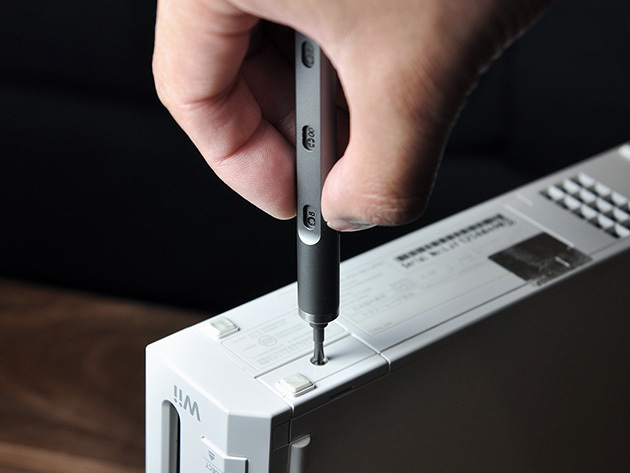 The Tool Pen Mini: 22-Bit Aplus Edition has just about everything you’d need go to town on any item that the manufacturer hasn’t purposely made impossible to fix yourself (Apple, we’re looking at you…). The Tool Pen Mini may be small, but it packs a wallop. With this Aplus Edition, you’ll get one sleek pen-like screwdriver, along with 22 interchangeable bits. This compact tool is therefore equivalent to a full set of 22 different screwdrivers, making it suitable for fixing a wide variety of items requiring intricate work, but occupying only a fraction of the space in your home, shed, or workspace. – Can fix a variety of electronics & other objects: smartphones, laptops, tablets, toys, appliances, remote controls, etc. Normally $89, with today’s rebate it’s only $75, shipped free of charge. By David Ponce on 12/10/15 • Leave a comment! You spend your day sitting on your behind, typing away at your keyboard, not burning a single calorie and getting fat. 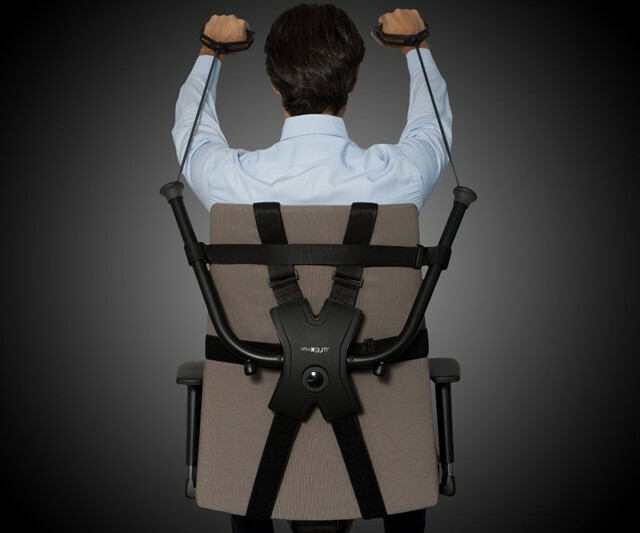 It’s the life of most of corporate America, but you don’t have to take it. With the Office Gym, you’ll be able to perform some basic resistance training exercises that will keep some of your muscles toned, and your blood flowing. 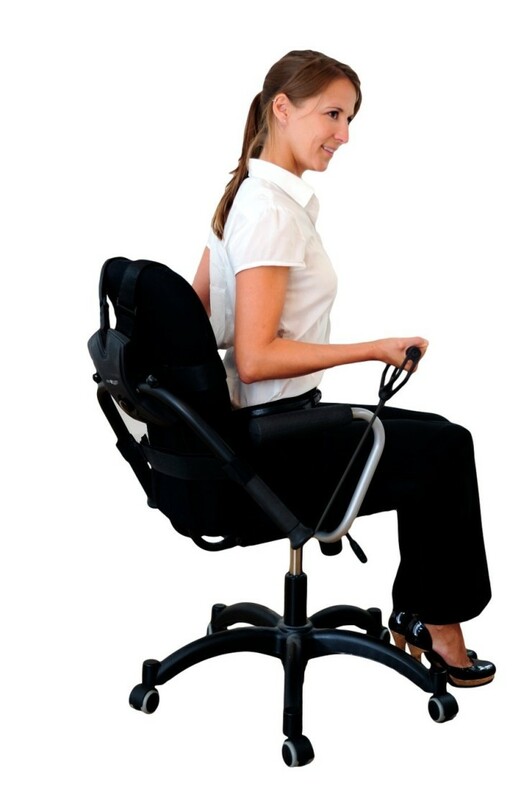 It attaches directly at the back of your chair, and lets you do a variety of “3D exercises”. It’s not quite as good as a proper session at the gym, but it’s definitely better than nothing. For the pleasure of being able to get some physical work done at work, you’ll have to pay $129. By David Ponce on 11/13/15 • Leave a comment! Doomsday preppers are always on the lookout for the next tool that will supposedly help them survive the collapse of civilization. 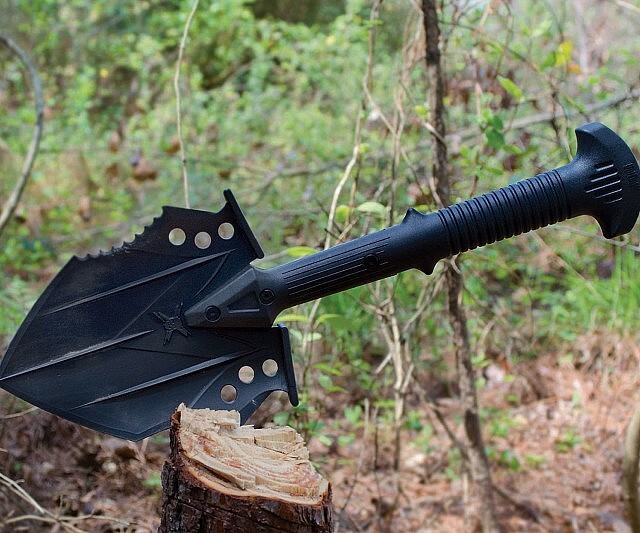 While a loaded shotgun and non-perishable foodstuffs seem like essentials, you’ll likely want to take a look at the M48 Kommando Tactical Survival Shovel with Sheath by United Cutlery. 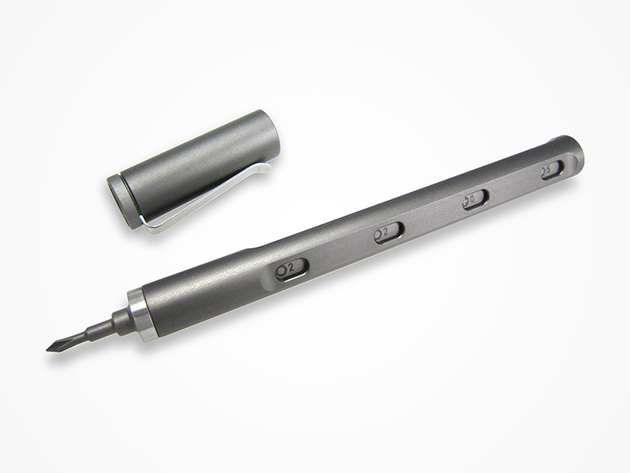 – Features virtually indestructible, injection-molded nylon handle with 30% fiberglass & nylon reinforcement. – The shovel head is made of tempered 2Cr13 stainless tool steel with a hard, black oxide coating. 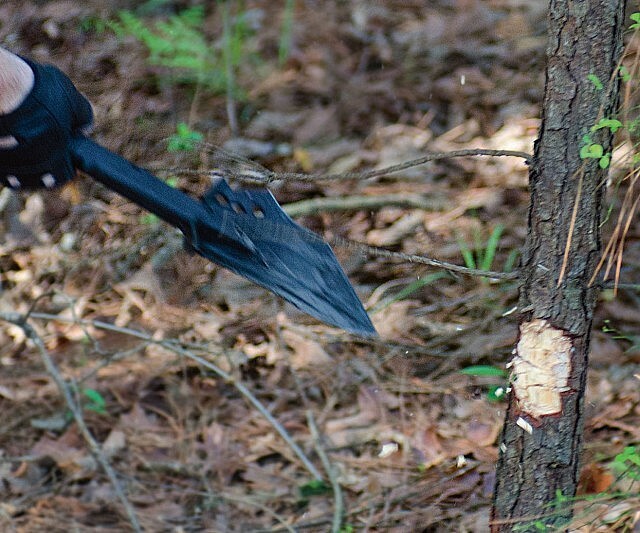 – Perfect for camping and outdoors use, light chopping, or for use as a defensive weapon in an emergency situation. – The shovel point edge is sharpened, with a partially serrated edge on one side, and a concave chopping edge on the other. – Includes a reinforced nylon belt pouch. The best part is that adding a cool item to your survival arsenal doesn’t have to break the bank now… you know, before banks are obsolete? It’s $41. By David Ponce on 11/02/15 • Leave a comment! We’re not sure why a company would sell a drill “for special forces” to the regular public, but we suspect it’s just a marketing gimmick. It’s a nice one, to boot, since we’re definitely intrigued by this all-black drill that also works underwater up to 100m. The Nemo SPECIAL OPS (SO24-6Li-100) is catered to professionals working in special operations and the special forces. With a depth rating of up to 100m (328ft), this drill has a salt-water resistant ALL-BLACK paint job with no logo for maximum concealment. 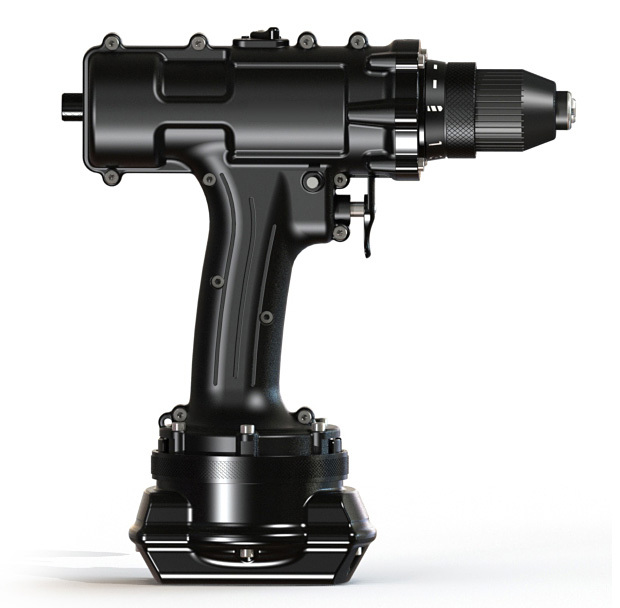 Its 1000-watt brushless technology ensures maximum efficiency and durability. 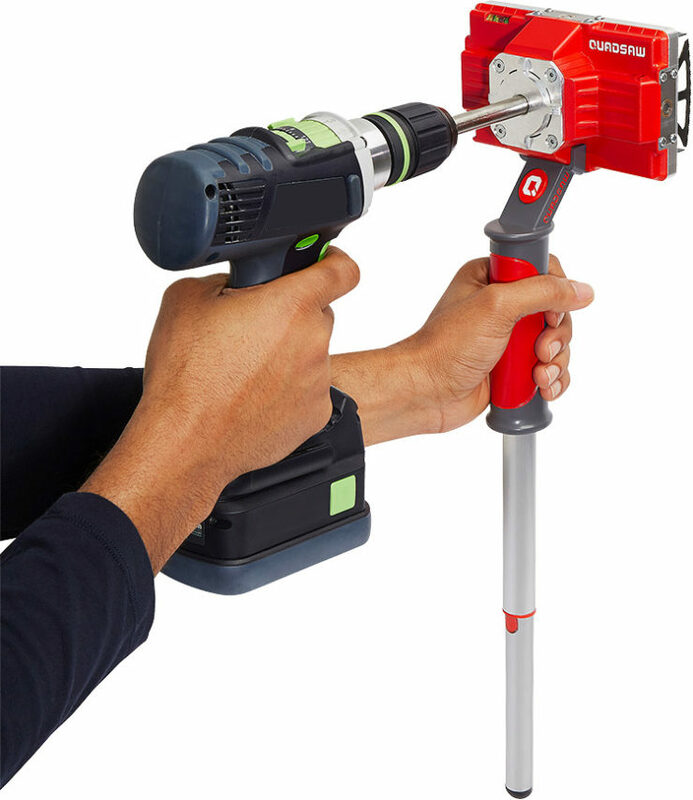 It comes with a durable carrying case, battery charger, pressure valve and pump to pressurize the drill, and two 6Ah batteries, to make sure you’re ready for jobs that require extra power and time. The Nemo SPECIAL-OPS comes with additional accessories geared towards the tasks carried out by special forces, and ranks among some of the top cordless drills on the market. Nemo SPECIAL OPS accessories include a diving headlamp, a diving tool belt with tool bag, and a handy waterproof bag to keep your battery charger dry. It’s not like we’re about to go don a wetsuit and drill something underwater, but it’s nice to know that if the fancy took us, we could. Well, no… we couldn’t… because the thing costs an astronomical $1,720 and is currently out of stock. By David Ponce on 10/15/15 • Leave a comment! Electronics these days are designed to be harder to repair yourself. 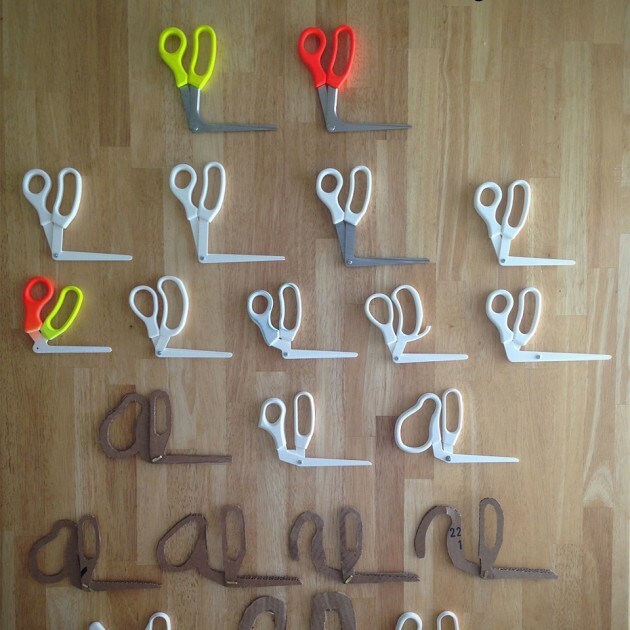 That doesn’t mean they’re impossible to fix, but you do need the right tools for the job. The Rapid Repair Tool Bundle comes with 10 such items that could make the task that much easier. Dropped your phone? Broke your iPod? Save some cash by repairing your gadgets yourself with this deluxe kit of tools needed to get them up and running. Or, maybe just indulge your inner engineer and use them to take a peek inside at the electronic inner-workings. 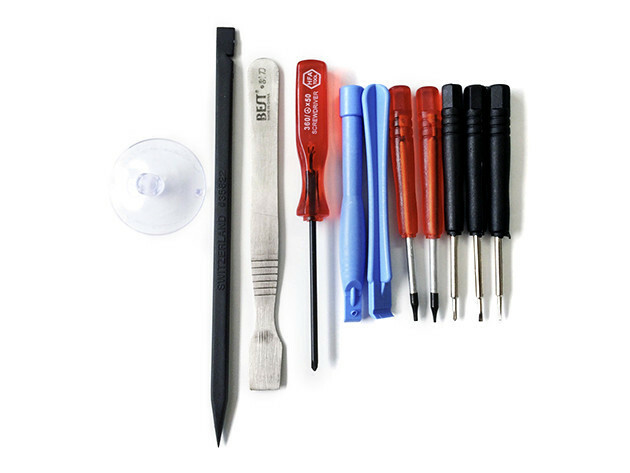 Whatever you intention may be, this kit—composed of six mini screwdrivers along with other device-opening essentials—will allow you to take apart and reassemble small electronics in confidence. These types of tools aren’t particularly expensive to start with, but it’s nice when they’re even cheaper. The kit normally would retail for $20, but you can have it for $14.99. By David Ponce on 10/01/15 • Leave a comment! Drawing with an actual pen and ink is a thing that people still do, no matter how much digital drawing tablets have evolved. 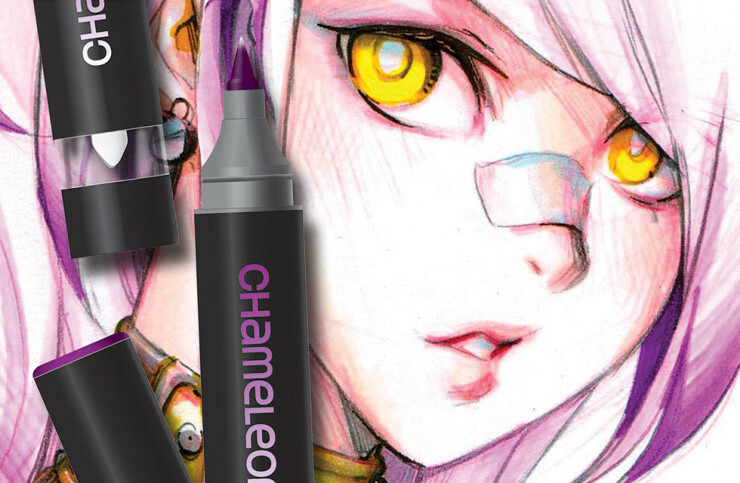 The Chameleon Pen is an interesting new type of drawing tool that allows you to produce multiple color tones, stunning gradations, highlights, shading & seamless blends, all with one pen. It does this by a process they call “fusing”, during which the nib of your pen enters into contact with the mixing nib of another flask containing coloured toning medium; the longer these two stay in contact, the stronger the gradient will be. The toning medium basically flows into your pen when the nibs touch, mixes in the nib, and then flows back out smoothly as you draw. It’s rather complicated to explain properly, but watch the video below and you’ll see the beauty. 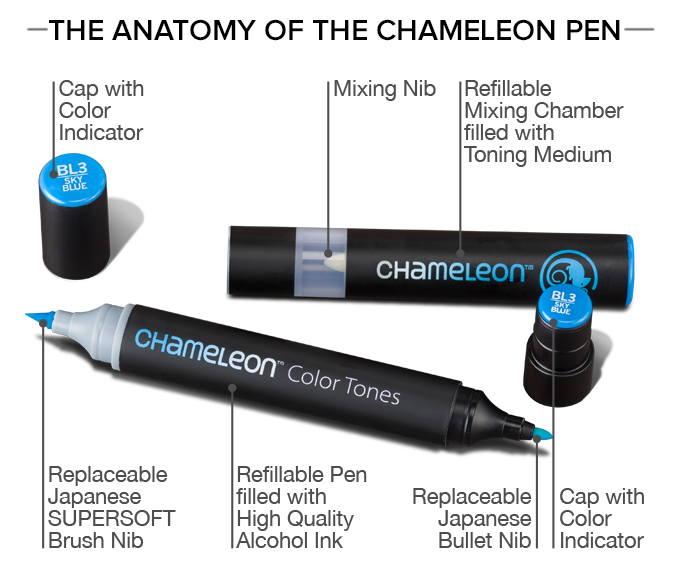 Prices start at $5 for one random colored pen, and $25 for 5 skin or gray toned Chameleon Pens.